Group booking policy (more than 7 people) will be applied individually. Please contact property to get all terms and conditions for group bookings, but the main are the following: 50 % must be paid in advance - charge of the credit card which has been used for that booking. The rest is being paid upon arrival. - Cancellation policy: 1 months prior to arrival date free of charge, later no further cancellations/modifications are accepted. 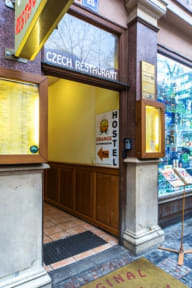 In case of group bookings or in case that your group occupies the entire dorm, the refundable guarantee deposit of 40 EUR / person will be charged upon arrival in cash in CZK or EUR, and in case our property doesn’t get damaged during your stay, it will be fully refunded upon check out. There are so many free food like cornflakes and pasta. It's really convenient. The wifi is weak, i cannot use it in dorm.